Shah Pur Canal Division LJC Sargodha has announced 17 New Jobs in Daily Pakistan Newspaper March 09, 2018. Desired Candidates who meet the required Criteria may apply for Latest Government Jobs 2018 for Baildaar 11 Posts, Canal Garden 01 Post, Sweeper 02 Posts, Gardener 01 Posts, Chowkidar 01 Posts and Gate Keeper 01Posts. 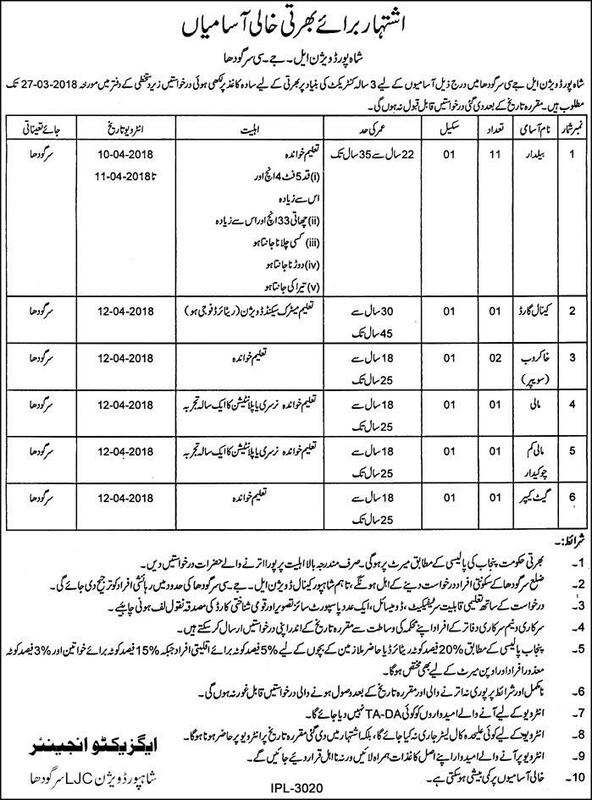 Only District Sargodha domiciled candidates are eligible to apply for these jobs however Shah Pur Canal Division Candidates will be given preference.